After harvesting, each kind of tea requires a specific treatment of the tea leaves. 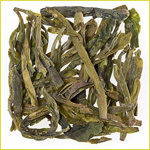 Green teas obtained using the same leaves but heat-processed, preventing later fermentation. Semi-fermented teas such as withered and slightly fermented Oolong teas. Their specific flavours are due to the tea variety grown in Formosa (Taïwan). In each case, the total weight of processed leaves is 4 times inferior to the weight of freshly harvested leaves. Withering tea: withering tea or wilting involves removing moisture of fresh tea leaves. As soon as they reach the factory, tea leaves are spread on metallic grids in specific containers. Powerful fans remove up to 50% of the moisture. This very delicate stage lasts generally 15 to 24 hours, and is operated at a steady temperature of 35°C. Rolling tea: this process involves rolling and twisting the tea leaves for 30 minutes. When the leaves are withered and smooth enough, they are rolled lengthwise, using specific machines and pressed in between two horizontal compressing disks, one of which animated by a rotary movement. Cell breaking occurring in this process releases essential oils and allows proper fermentation. A first screening of aggregated elements allows primary grading. Fermentation: the real transformation of the leaves to black tea occurs at this stage. For the needs of that process, leaves are sorted in fine layers (5 to 7 cm) on aluminium or glass boards, in a very damp atmosphere (90 to 95%) at a steady temperature of 22°C. During this process, temperature inside the leaves will increase up to 29°C due to chemical reactions, and will then decrease. The fermentation must be stopped at peak temperature. The fermentation lasts 2 to 3 hours depending on quality, season, region, colour or desired flavour. Drying tea: to stop fermentation, allowed by a damp atmosphere, tea leaves must be placed in a dry atmosphere at high temperature. Drying takes place in giant dryers where tea runs on conveyor belts for 20 to 25 minutes. As they turn black, leaves only keep 4 to 5% water maximum. Tea classification and grading: tea may be immediately sorted in two different grades, broken tea or full leaves. 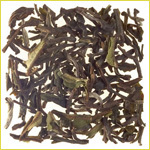 Broken tea may be obtained naturally as full leaves may break during manipulations, or artificially cut in the machine. Full leaves are ranged into “Pekoe” and “Orange Pekoe”, but this classification is only related to the grade of the leaf and not to its inner quality. Grading is either operated by a machine or by hand with a sieve and must be done quickly as tea might get damp. Packing: as it is not possible to produce the same kind of tea two days in a row, production over 2 to 3 weeks is blended to get standardised batches. Tea is packed in plywood boxes doubled with aluminium. These boxes contain 35 to 50 kilos of tea, depending on the grades, broken teas being more compact. Batches are bought directly or sent for auction. Boxes are always travelling with samples for expertise. This process differs from the traditional process only at the rolling stage. In this CTC process, withered tea goes through CTC machines consisting of two step-toothed rolls swirling at two different speeds. The crushing process of cell leaves is much more efficient. Tea obtained through a CTC process is stronger, much more colourful but less perfumed. A CTC process produces BOP, Fannings or Dust. These teas may be found in tea bags. Developed at the Tockai experimental station, Assam, this process quickens withering and rolling stages before the fermentation phase, thanks to a giant “rotor” located in a 20 to 40 cm cylinder dragging away and compressing leaves in record time.. This process avoids withering but requires leaf cutting before rolling, and enables extra strong drying after fermentation. Green teas are non fermented teas. Hence the preparation aims to avoid fermentation. In order to avoid it, enzymes must be killed by dramatically heating leaves to a peak temperature of 100°C, in big basins or steamers. Leaves become really smooth and ready for rolling. Leaves are alternatively rolled and dried several times. These operations are repeated until leaves are properly dried. Leaves are then classified in different categories. The product may be artificially coloured for a more attractive appearance, generally with indigo and lime sulphate to fasten colours without damaging the tea quality. Halfway between black and green teas, semi-fermented teas are the specialty of Formosa and very popular in the US. Leaves are withered under the sun and then fermented twice. They are then roasted, rolled, re-roasted and then dried in three stages. This process divides the weight of fresh tea leaves by 4. Quality depends on seasons. Summer Oolongs are considered the best, followed by Autumn Oolongs, and at a lower level we may find Winter and Spring Oolongs. 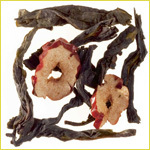 It should be noted that, unlike black and green teas, there are no “grades” in Oolongs.